Quick: name a contemporary love poem. Hard, right? In contemporary poetry, one doesn’t find much about love – the emotion, the feeling, the condition that is so characteristics of a considerable body of poetry from earliest times to the 20th century. Think Song of Solomon, the Greeks and Romans. Think of Boccaccio, the Elizabethans (those sonnets!) and the Cavalier poets, the Romantics and even the Victorians. But something happened in the century just past. Perhaps two world wars, a major depression, the rise of the media and the dominance of Freudian psychology pushed love poetry into a forgotten corner. I’ve even heard that feminism made love poetry a dangerous occupation. Whatever the cause or causes, love poetry isn’t what it has been in times before ours. Which makes Dave Malone’s book of poetry Under the Sycamore all the more remarkable. Malone, the author of several books of poetry and a university professor, first published the book in 2003. It is a volume of 100 poems, all untitled and all short (the longest is eight lines). And they are all poems about love – love yearned for, love found, love lost, love regained – almost a story of a relationship that happens over an entire lifetime. These short poems are filled with longing and passion, the self- and shared knowledge of two lovers, along with emptiness, loss and then reconciliation. To read these poems (and to read them aloud) is to sit in a well-lit, under-furnished room, watching the object of your love, who is unaware of being observed. 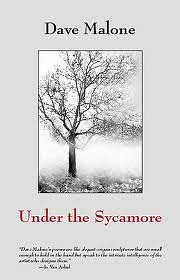 Under the Sycamore is a beautiful volume of love poems. We need more of them. I loved this post. Never really thought about whether Love Poetry was big anymore or not. I think, though, as you say… it’s time for more love. And Dave’s poems are simply delicious! Wow, wow, wow. Glynn, I am very moved. Thank you for this glowing review–and for viewing my poems in the context of history and feminism. And thanks much for this, L.L. and for the tweet this morning. Makes me smile just thinking about it. Thanks Dave, for the love. You’re right, there has been a shortage of love poetry. From the two you mention, they look like they are meant to be read aloud, to become breath. So good … both the review and the poems! I especially like the one with the snow.